Quick Thoughts: Laini Taylor has created a vivid world, lush in color and grand in scope. The Daughter of Smoke and Bones blends together aspects of mythology, fantasy and science fiction to create something that fits together comfortably but feels quite unique. The Daughter of Smoke and Bone is an Audie award Nominee in the Fantasy Category. I am going to say something that I know annoys many people, I don’t listen to a whole lot of Young Adult. Now, I don’t say this as some sort of proclamation of superiority, it’s just the fact. I choose my novels based on what interests me, and last year, less than 5% of my total listening was of young adult novels. Now, I in no way ever feel any sort of shame when I do take on something that is young adult. In fact, the book I declared to be my favorite audiobook of 2011, Dan Well’s I Don’t Want to Kill You is arguably young adult. I find the recent attacks on young adult literature to be ridiculous. I am someone who has met the legal age requirement to become president of the United States, and have no issue admitting I read The Hunger Games, and enjoyed it. The idea that some novels are less worthy of my attention because of how they are marketed is ridiculous. For me, in essence, that is what Young Adult literature is, a marketing choice. Sure, there are style and content choices to be made when writing a novel for a young adult audience, but in the end the ultimate designation of that label is a marketing choice. For example, I recently listened to Joe R. Lansdale’s Edge of Dark Water. Brilliant novel which has been marketed as an adult novel, despite the fact it is a coming of age story centered on three teenagers that deals with some classic YA themes and has been compared to Twain’s The Adventures of Tom Sawyer and Stephen King’s Stand By Me. So, in the end, should I really base the suitability of a book on an arbitrary label? When I have ventured into the YA market, I find these novels to offer a lot to adults, in sociological and entertainment value. The Daughter of Smoke and Bone is an Audie nominee in Fantasy and the only Young Adult novel in the three speculative fiction categories, but it easily holds its own against the adult novels nominated along side of it. The Daughter of Smoke and Bone is the tale of Karou, a 17 year old art student in Prague, with natural blue hair, tattooed palms and a necklace that grants her small wishes. While maintaining the trappings of a normal life, she is at the beck and call of her chosen family, an underground group of seemingly monstrous Chimera who traffic in teeth. Laini Taylor paints the opening of her young adult fantasy novel with brilliant color, from the blue of Karou’s hair, to the black hand prints burned into secret doorways across the world. Despite the novel being set in modern day Prague, you feel the novels otherworldliness in each sentence. With this vividly drawn world and compelling setup, Taylor pulls you instantly into the story, creating a true desire to learn the secrets behind Karou and her strange family. The Daughter of Smoke and Bone is a novel in two stories. There is a very specific moment in this novel, a game changing event that creates a distinct delineation in plot. There is measured change in tone and feel of the novel. I absolutely loved the first half of the novel, with Taylor’s lush prose and original manipulation of fantasy tropes creating something with a truly unique feel. I didn’t feel as effusive about the second half of the novel. I liked it, but its contrast in tone and the brilliance of the first half had me longing for when the two halves would again merge. There is a sort of inevitability of plot in the second half, you generally know where it’s going, just not too sure what route it will take. This contrasts sharply with the first half which is full of potentialities you can only dream of. One of my favorite aspects of the novel was the complicated familial relationship between Karou and her Chimera family. The Chimera, as a race, are a blending of man and beast, and, at least on the surface, reminiscent of the monsters of legend. Yet, to Karou these are the people who raised her, gave her the attention she needed, and in their own mysterious ways loved her. I did struggle with the romantic elements of the novel, which is typical for me. Personally, I prefer romance to be a byproduct of a tale and not it’s driving force, and I don’t find myself overly concerned with two incredibly attractive people discover that they are attracted to each other. Yet, that is a personal preference, and not a reflection on the writing. All together Taylor has created a vivid world, lush in color and grand in scope. The Daughter of Smoke and Bones blends together aspects of mythology, fantasy and science fiction to create something that fits together comfortably but feels quite unique. 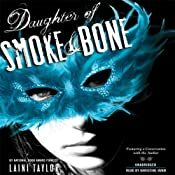 I am a big fan of narrators who create a unique and consistent voice for their characters and the worlds they reside in and Khristine Hvam does this wonderfully in The Daughter of Smoke and Bone. Hvam infuses her voice with character, giving Karou more than just a default teenage voice, but adding an exotic spin that fits so well with her personality. 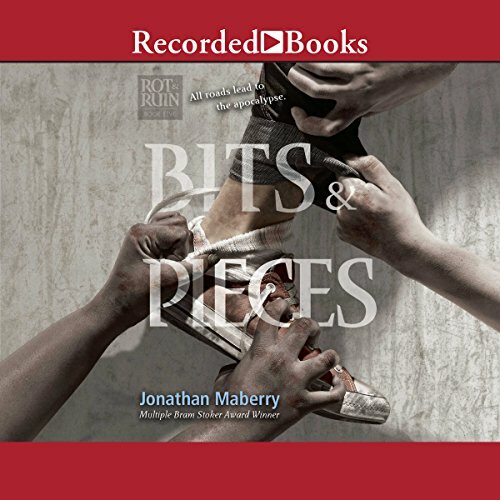 I think what will stand out for many listeners, and is a big reason this title has been nominated for an Audie, is Hvam”s ability to capture some of the unique characters in this novel. She transitions from the incredibly creepy to the soft and beautiful with organic ease. Yet, for me, it was her narrative voice, and ability to bring Taylor’s vivid world to life that stood out. I have listened to a few titles now that Hvam has narrated, and in each of them, you can tell she understands the characters and tailors her voice to fit them. This ability is what separates the truly good narrators from the greats. The Daughter of Smoke and Bone is a vivid fantasy that truly comes alive in the hands of this gifted narrator. This is currently one of my favourite books, and I agree that Hvam’s performance was phenomenal! This is my first narration by her, and I’m pleased to know that she tailors her voice to each character in other titles as well. I’ll definitely have to look some up! I loved the book, and will have to listen to the audio sometime. I haven’t had the opportunity yet to listen to any books narrated by Hvam, but will definitely keep her in mind. I see she’s also narrated Pure by Julianna Baggott & I’ve been meaning to read/listen to that one. Glad you found that Daughter holds it’s own with the other Audie nominees. I have this slated as a summer listen and I’m looking forward to it! I don’t know what it’s about; but the realistically grounded and vividly descriptive fantasy world appeal to me. I hope the romantic elements aren’t too much (There is only so much teen angst I can handle); but we shall see… Hvam is a new-to-me narrator but it sounds like she’s done great job! This sounds really good, I remember all of the YA bloggers going crazy over the print when it first came out. I will definitely have to look into listening! That is a somewhat ambiguous label. It’s just about Marketing orientation, no more. “The Book Thief” was released in Australia for an adult audience, but in the U.S. it’s been promoted as a YA book.